WiFiRanger is an affiliate partner & sponsor of this article. A special offer for RV LIFE readers – FREE shipping, FREE LTE modem & great support! Discount Code below for RV LIFE readers only! One of the biggest challenges RVers face is finding a reliable internet connection wherever they travel. Even though most RV parks have WiFi available, it’s not always free nor is the signal always strong enough to work or watch Netflix. If you need consistently fast internet in your RV, I strongly suggest you invest in a WiFi extender like the SkyPro LTE from WiFiRanger. With the SkyPro, you can easily connect to WiFi hotspots that would normally have a weak signal. WiFiRanger has been popular among RVers for years and their latest SkyPro is no exception in quality. The WiFi booster comes in an all-in-one package with everything you need to stay connected. How does the SkyPro work? The SkyPro can be easily mounted on any flat-surface RV roof. It connects to an indoor Core router with an included 30-foot-long cable. No need to drill a hole, you can run the cord inside through a refrigerator vent, slide, or engine compartment. Then simply plug the cable into Port 5 of the router to power up. Once powered on, you can set up a private network on the router for all of your wireless devices. It has several LAN ports and allows USB tethering a 3G/4G Aircard or MiFi device. The SkyPro can then help you get (and stay) online by searching for WiFi signals, the nearest cell phone tower, or both. The flexible antennas can bend down to 5″ clearance to help protect against trees. 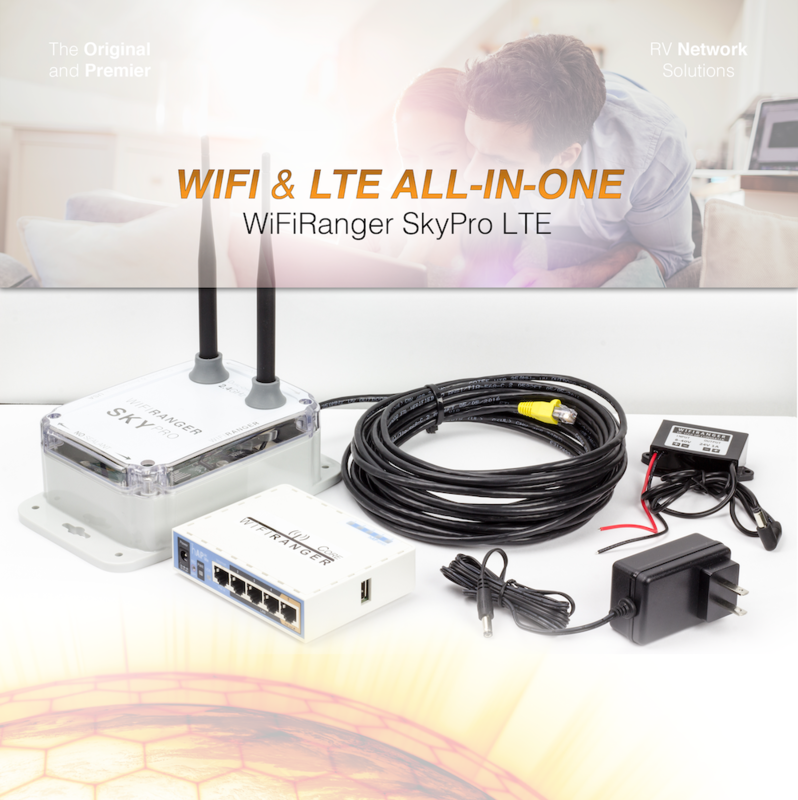 For a limited time, WiFiRanger is offering free shipping and free Millenicom modems with their SkyPro Packs. The LTE modems come preinstalled with T-Mobile SIM cards that are quick and easy to activate. Use the coupon code BOBLTE on their website while supplies last!